John McDonald, the President of Audience LLC, celebrates his birthday this month. John was proudly born in the year of the ox. Referencing a place mat from the local Chinese buffet: "People born in the Year of the Ox are patient, speak little and inspire confidence in others. Although they speak little, when they do they are quite eloquent." These same traits might also be applied to the sonic qualities of the cables that John's company produces, but more of that later. 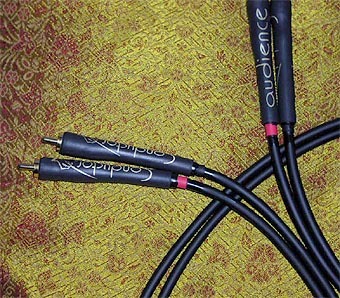 The Conductor cables are entry-level products, however they have similar design characteristics as Audience's higher-resolution Maestro and reference Au24 line currently with Stephæn. The Conductor cables are constructed with copper conductors sheethed in polypropylene insulation and a cross-linked polyethylene jacket. 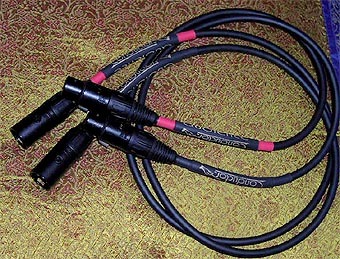 The interconnects appear lean and tidy in basic black and are terminated in either custom unbalanced or Neutrik XLR balanced connectors. The unbalanced Conductors have a simple-looking RCA to reduce the coloration beefier connectors might introduce. Unlike the heavier RCA connectors I have on my Analysis Plus interconnects, the unbalanced Conductors have a soft plastic heat shrink sleeve that extends from the cable up to the edge of the connectors. I was a little nervous that the connectors might break from repeated use, but that was not the case. The connectors were robust enough to handle frequent switching and they always connected securely. I liked the way the custom connectors added to the tidy appearance of the cables. According to the eloquent Audience website, the Conductor cables are designed for low eddy current resistance, a feature common to all Audience cables and not related to dapper gents Nelson Eddy or Duane Eddy. "Eddy-currents are created by the magnetic field found around a cable when an electrical signal is present. This magnetic field builds up and collapses as the signal varies. When the field collapses, it induces an opposing voltage back into the cable. This opposing voltage causes eddy currents in the conductor. If they could be seen, eddy currents would look like swirling water in a river. This late- arriving opposing voltage disrupts the original signal by inducing a time-smearing artifact". Audience states that these eddy currents result in less clearly defined details and less powerful bass - the presentation is said to become too relaxed. Audience pays careful attention to the geometric configuration of their cables to reduce the effect of these eddy currents. The Conductors are also low capacitance, low inductance designs with a small diameter to minimize impedance. I was not planning on reviewing another set of power cables when I requested the Conductor interconnects for review. 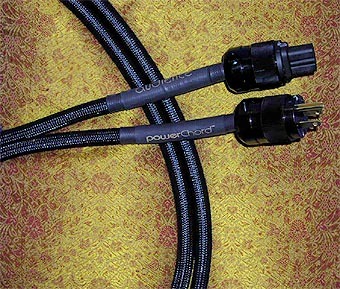 John McDonald simply but eloquently inquired if I would be interested in reviewing their new powerChord power cables. He told me they were really special. I should give them a listen. I was skeptical but agreed to give them a whirl. In contrast to the slim Conductors, the ½" thick powerChord in its braided plastic jacket is beefy in appearance and terminated with a WattGate IEC and Marinco male power plug. The Audience powerChord is designed for low impedance traits and eschews poor dielectrics. This low impedance is claimed to result in lower noise floor and a better dynamic presentation. The powerChord is not a solid core cable, hence cannot be damaged by bending. The cable is flexible enough to maneuver easily. Its only slight drawback is the way the connectors attach - you'll need about 5 inches clearance behind a component to accommodate this stiff section of the cable. The powerChord's insulating materials exhibit extremely low dielectric absorption but this is not a shielded design - the people at Audience state that some types of cable shielding can actually hamper the cable's effectiveness as a conductor. According to the information presented on their website, the effect of airborne noise on your power cables is negligible. Almost all of the noise in a consumer A/V system arises from tiny voltage drops caused by leakage or ground noise currents. Audience posits that ordinary cable shielding has almost no effect on the magnetic fields of the passing signal but can add coloration because the shielding raises the cable's native impedance. The website states that "increasing the distance between signal cables and powerful magnetic fields is the best cure for either electric or magnetic field problems", however the "low impedance design" of the powerChords provides a solution to protect them against cellphone and other ultra-sonic noise. Because I was breaking in other components at the time, I ran the Audience cables for over 200 hours before listening critically. Audience says their cables start to sound good after 2 to 3 hours playing time and will continue to improve for approximately 50 hours. Just think how great they sounded after 200 hours! I really can't say too much about the balanced Conductors because I do not have any other balanced cables to compare against. The BV Audio P-1 preamplifier is a balanced-only design so I couldn't A/B the unbalanced Conductors. I did use the Balanced Conductors in my reviews of the P-1 preamplifier and Parts ConneXion-modified Outlaw Audio M200 monos. Judging from my critical review of their unbalanced siblings, the balanced Conductors should exhibit similar sonic characteristics. I have requested an extension to see if one of my audio friends can help me do a balanced/unbalanced comparison of the Conductors plus a comparison of the balanced Conductors with another balanced cable. I will let you know the results in a follow-up. I'm a sucker for kraut rock, new age and space music. I've heard the latter described as a new form of classical music as well as music for people who don't like music. However, I love to hear musicians use synthesizers and real instruments to create musical pictures of fantastic places and experiences. One of the best in this genre is Christopher Franke, former member of Tangerine Dream. Christopher has worked on soundtracks for movies and television shows like Babylon 5 as well as solo projects. The London Concert [Sonic Images 6508, 1993] is a 1993 live recording with acceptable sound and a reasonable amount of audience ambience. The synthesizers, electronic drums and guitars sound appropriately evocative although they don't exhibit the same sparkle in the highs and bombast in the bass that they would in a really good studio recording. "Dolphin Dance" is a reworking of a Tangerine Dream song with sequenced rhythms, electric guitar solos and an opening whoosh of synthesizer washes that characterize this type of music. With the Conductors between the DAC2 and my integrated amplifier, the music immediately sounded clearer. The whoosh had more of an undulating quality and the following staccato keyboard playing had greater presence than I thought was contained on the recording. With my Oval One interconnects, these details were less pronounced. Although bass is not a hallmark of this recording, the hypnotic programmed bass line over steady electronic drumming did sound weightier on the Oval Ones, albeit at the expense of clarity. The Analysis Plus cables did impart a smoothing character to the music which the Conductors did not. The Conductors did not change the character of my system. With the Conductors, the sonic picture went from slightly fuzzy to images that were sharper and better defined. I could hear the bass tones bouncing clearly between the right and left speakers. Personally, I prefer improved bass articulation over bass weight. The Conductors sounded more truthful in the bass, especially important since my bookshelf speakers can only reach so low. The Conductors also made the aching electric guitar solo sound edgier and more communicative than the Oval Ones. While my Audio Refinement Complete does have some limitations, the Conductors prompted greater musical detail from my system. Next I tried a better recording and more powerful equipment. I used the balanced Conductors between the BVaudio P-1 and PA300, and the unbalanced conductors between the DAC2 and my CD player. For Valentine's Day, my wife and daughter gave me the latest Norah Jones album, Feels like home [Blue Note Records 84800 2004]. I think her voice sounds like a cross between Macy Gray and Leon Redbone, always easy on the ears. I prefer this album to her first one - it retains the relaxed ease but introduces a few surprises like the duet with Dolly Parton. "In the Morning" is an almost rocking number about obsessive love. The recording offers a nice big soundstage filled with drums, bass, electric guitar and Norah's voice with electric Wurlitzer piano. With the Conductors, I could hear those slight shifts in emphasis indicating Norah's movement around the mic. I did not hear this as clearly with the Oval Ones which emphasized the steady pulse of the wood block and the wow sound of the electric guitar. While the Oval Ones emphasized smooth tonal and rhythmic qualities, the Conductors focused on air and placement. The Conductors offered a little more resolution than the Oval Ones, which sounded slightly muted in comparison. On older recordings like "Hidden Treasure" from The Low Spark of High-Heeled Boys by Traffic [Island 90026, 1971], the less-revealing Analysis Plus was more forgiving because it emphasized the bass while rounding over the highs. This is noticeable during the start of the song where the flute and Steve Winwood's voice sounded less grainy and more polished. The rhythm section benefited from the extra bass wallop though it still sounded flabby. With the Conductor, Steve Winwood sounded a little rougher and the flute still had some grain, but I could also hear more of the air and presence details that portray the actions of the performers. The rhythm section sounded wimpy and thin but this is appropriate for the recording. The Conductors didn't add any artificial sweeteners or tissue implants. But enough of rock and pop already - what about real music?